Linfield crashed to a dramatic defeat in this Toals Bookmakers County Antrim Shield final at Windsor Park. 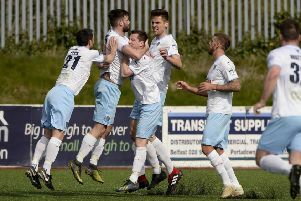 The Blues have failed to land a trophy for two years -- and Ballymena United guaranteed that horrible run would continue. In contrast, it’s the second Shield success in four years for Glenn Ferguson and his braves. Goals from Paddy McNally, David Cushley and Eoin Kane made it a night to remember for the lads form the Braid. Although David Healy’s team managed to cancel out McNally’s opener, Linfield only really upped the ante over the last 10 minutes and Mark Stafford set up a thrilling finish by heading the Blues back into it..
Linfield were right out of luck on only seven minutes. Matthew Clarke whipped in a great cross from the left, which was knocked back into the box by Kirk Millar, but Guy Bates’ shot was hooked off the line by Jim Ervin. United hit back with a David Cushley free kick that was grabbed at the second attempt by goalkeeper Ross Glendinning following Matty Clarke’s clumsy foul on Allan Jenkins. Healy’s boys came within inches of breaking the deadlock on 16 minutes. The industrious Jamie Mulgrew gobbled up a sweet flick from Andy Waterworth and when he let fly from 20 yards, the ball rocketed back off the crossbar. But it was the Sky Blues, who finally forged in front on 32 minutes. Mulgrew’s silly challenge on Cushley gave Tony Kane the chance to launch a wonderful free kick and big McNally rose above everyone to power the ball past Glendinnig. Linfield showed early intent at the start of the second half, with Waterworth motoring on to a pass from Mark Haughey, but he could only blast his effort over the top. But the Blues were level on 52 minutes -- a gift from United keeper Alan Blayney. The big former Northern Ireland man made a total hash of clearing a Niall Quinn free kick and when the ball broke for Bates, he finished low into the bottom corner. United were not to be denied as they regained the lead on 59 minutes. Cushley gobbled up a Willie Faulkner pass before firing in a vicious drive that took a wicked deflection off Mark Stafford, leaving Glendinning helpless. And, United hit a killer third 14 minutes from time. Again it was another comedy of errors in the Blues defence with Mark Stafford fluffing his lines, leaving Eoin Kane with the chance -- and he buried it. Linfield bravely tried to retrieve the situation with Stafford making up for his blunder by heading home a Mark Haughey cross with five minutes left and, when Millar’s shot hit the bar in injury time, United knew their name was on the trophy. Linfield: Ross Glendinning, Stafford, Haughey, Callacher, Waterworth, Bates, Millar, Ward (Frazer 76), Clarke (Gaynor 64), Mulgrew, Quinn (Burns 66). Subs not used: Hegarty, Reece Glendinning. Ballymena United: Blayney, T Kane, McBride, McNally, Thompson, Taggart (Henderson 92), Jenkins, Cushley, Faulkner (Shevlin 85), E Kane (Ferguson 90), Ervin. Subs not used: Hanley, Nelson.